Back to: Knuckles the Echidna in Sonic the Hedgehog 2. Knuckles the Echidna in Sonic the Hedgehog 2, as the name suggests, tries to put Knuckles in Sonic the Hedgehog 2 with minimal changes to the base game. For the most part it's a success, but for one reason or another, some elements needed to change. 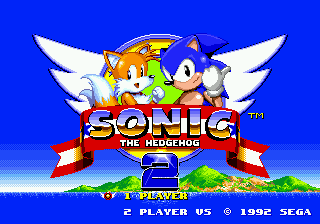 The most obvious step is to replace Sonic and Tails with Knuckles, and change up the title accordingly. While there are some similarities to his look in the title screen of Sonic & Knuckles, this render of Knuckles is unique to this game. The menu is removed, meaning no 2P mode and no options screen. The cheat codes are subsequently changed as well, so level select is available from the title screen. The Mega Drive can only display a finite number of colours. To accommodate the red hues of Knuckles, the blue hues of Sonic needed to be replaced. This means the title cards are all green (Knuckles' shoe colour) instead of blue. Shields are now grey. Sonic 3 was designed in such a way that the shields could look the same for all characters, but that luxary is not afforded to Knuckles in Sonic 2. Special stages are altered for Knuckles. The ring requirements are lowered, he isn't given a name and as a probable oversight, gains Sonic's tan-coloured arms (although as a side note, Tails also has the wrong coloured arms in these stages). Knuckles will also keep the rings he had when he entered the special stage - Sonic and Tails would lose theirs in the base game. The developers of Knuckles in Sonic 2 were a little inconsistent when it came to deciding which areas Knuckles would be allowed to get to. Chemical Plant Zone relishes in Knuckles' climbing abilities by placing extra lives at the top of towers. You can even glide between them to get more (before gliding past most of the stage to the exit). Knuckles has a shorter jump height, so this initial pillar in the first act of Aquatic Ruin Zone was removed. It would never stop Knuckles entirely, but it was presumably seen as inappropriate for the start of a level. A lack of blues means Sonic's face has to go from the slot machines in Casino Night. Tails is safe though. Hill Top Zone act 1 starts off with a bottomless pit. To prevent Knuckles from gliding too far, invisible blocks were placed to stop him. These blocks were added to Mystic Cave Zone to stop Knuckles from climbing. Oil Ocean Zone has some more Knuckles-only monitors. ...but it also features extra fans to prevent him from accessing parts of the stage. Wing Fortress Zone won't let Knuckles glide over the boss area - it introduces more invisible walls. This page was last edited on 21 February 2019, at 17:28.